My passion for this hobby started when I was a young boy growing up on the west coast of Florida. I was fascinated with all underwater marine life and loved to scuba dive and sport fish. I started in this hobby with a 20-gallon high tank housing an assortment of African cichlids, but it didn’t take long before I needed to take the next challenge, so I began to raise discus and freshwater stingrays. The challenge of keeping more exotic aquatic species in larger bodies of water soon became my obsession. I then moved to a 55-gallon saltwater fish-only tank, and then later progressed to a 155-gallon tank housing various angels and tangs. 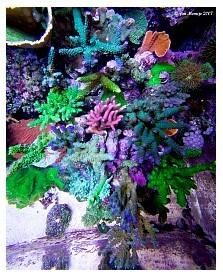 My first reef tank was a 125-gallon system containing mostly large-polyped stony and soft corals. 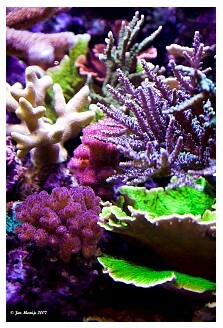 A 210-gallon system soon followed, containing an assortment of large and small-polyped stony corals, as well as soft corals. About three years later my obsession led me to the custom-built 500-gallon acrylic tank I have today, in order to house larger reef fish and my growing assortment of corals. 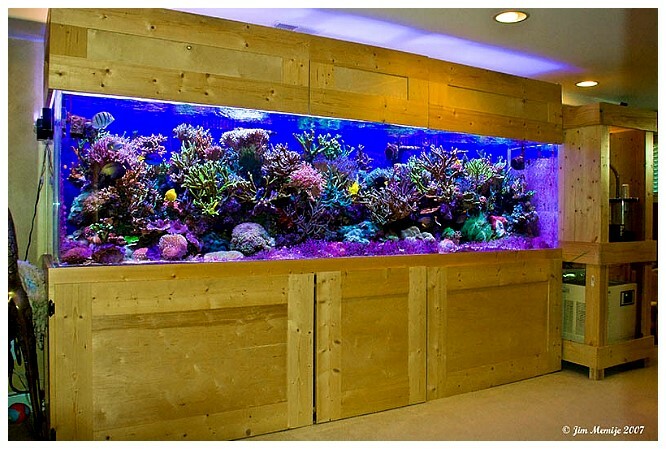 The aquarium is a custom-built Tenecor tank with 1” acrylic walls on all sides. Measuring 120” x 32” x 30”, it has two 1.5” drains and four ¾” returns. Extensive planning was a must for this system because we had very limited space and everything needed to be housed either underneath or beside the tank. The stand was custom-built by my wife, eight months pregnant at the time, whose hobby it is to build things. She reinforced the stand with 2” x 4”s and capped everything with ¾” pine to match our existing furnishings. 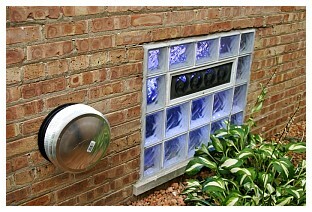 Custom venting was built into the sides of the base and canopy with four built-in variable speed fans. 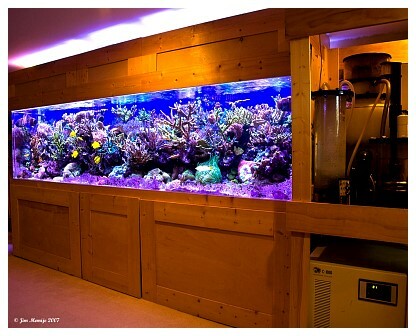 The lighting was put on a sliding system to allow easy access to the tank’s top area. 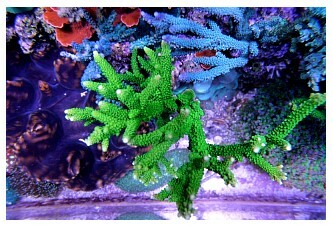 The canopy was designed so that the lighting could be raised as the corals grew. I think this is an important point that many aquarists often overlook when designing their systems. 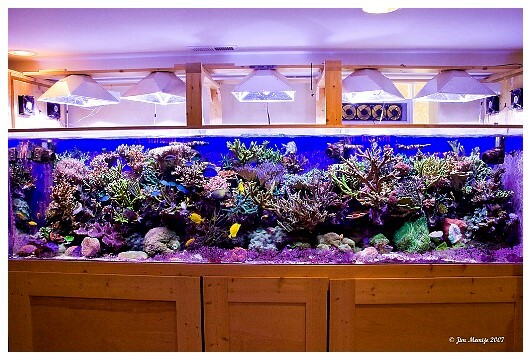 The corals will certainly grow, and if you are unable to adjust the height of the lights, the corals may become stressed from excessive light. This is truly an easy DIY adaptation for any canopy. She used three 1” x 2” pieces of pine attached to both sides of the canopy. The reflectors are attached to a 1” x 4” piece of pine and can be set on whichever slide I wish. As the corals grow, I can easily raise my lights. As you can see from the full tank picture, if I were to have my lights set at their initial height, the top of my reef would surely be affected negatively.The canopy also has easily removable front panels with an open top for ventilation. My wife also built a matching cabinet, located to the tank’s right side, which houses the chiller, kalkwasser reactor, protein skimmer and miscellaneous hardware. 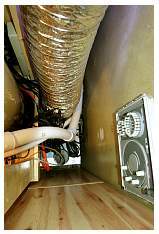 The cabinet’s top can be completely removed to easily access the chiller. 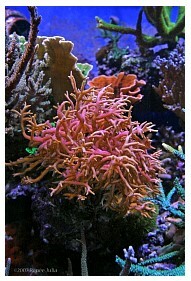 Lighting has always been a major debate in the reef aquarium hobby. I have been seriously involved in this hobby for 10 years now, and I can honestly say that I have tried every combination of lighting and every brand of metal halide bulb on the market! 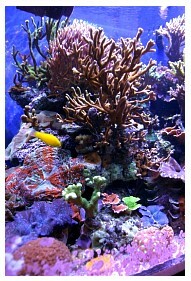 I had mixed results with all of them until I discovered the ReefLux metal halide bulbs from CoralVue. I started with five 400-watt 10K ReefLux bulbs, but within two weeks I noticed a significant difference in both the growth and coloration of my corals. I then decided to remove my VHO lamps because they were not needed with these 10K lamps. 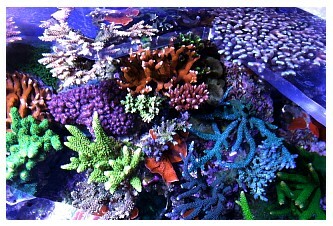 I continued using the 10Ks for six months and noticed that the corals’ growth was out of control. 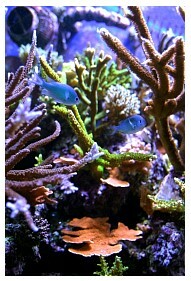 I then decided to try the ReefLux 12K lamps, and I was equally impressed with the noticeable blue hue they produced. I wanted to try these in order to get more “pop” in the corals’ color. 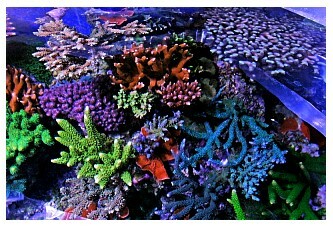 I was really surprised that the corals’ growth did not slow down, and the SPS were turning to insane colors! I have to give quite a bit of credit to these lamps for the success I have had with my reef. I run all five metal halides in CoralVue Lumenarc mini reflectors and they’re powered by CoralVue 400-watt electronic ballasts. I found that the correct combination of bulb and ballast is the key to getting the best results out of your lighting. I run my lights 10 hours in the winter and cut the photoperiod back to nine hours in the summer to help reduce the heat. Each light is on its own timer and they come on at 10 minute intervals, starting with the bulbs on either end and working toward the center. They shut off in reverse order, still at 10 minute intervals. The lights come on around 10:00am and shut off between 7:00-8:00pm, depending on the season. Water circulation is provided by four Tunze 6200 Stream pumps connected to a 7095 wave-making multi-controller, using a three-second pulse setting on all channels for maximum flow. In the future I intend to add two more 6200 Stream pumps or one 6301 Stream pump for improved flow due to the corals’ continued growth. 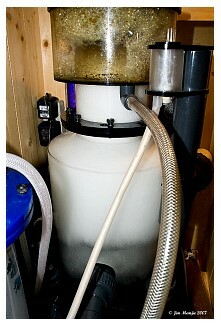 When I first set up this tank I decided to go with an MRC dual Beckett skimmer. Although it initially seemed to perform fairly well, I had to do weekly water changes because I noticed the system’s ORP levels were dropping drastically anywhere from four to five days after the weekly water changes. Adding to my disappointment was the extremely large and loud pump that was needed to run this skimmer. My wife was ready to kill me because of the noise, so I decided to change to the Octopus TDNW-300 skimmer. Compared to the Beckett skimmer, the difference was amazing! 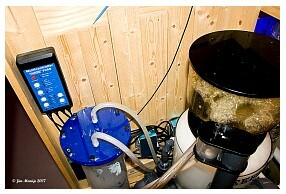 The Octopus skimmer worked really well and the three pumps that it uses generated very little noise. I thought this would be my final skimmer, but then I started reading about the Reeflo Orca Skimmer and the amazing results people were having with it. I have always used Reeflo pumps and consider them to be the best on the market, so I figured their new skimmer had to be something special. After extensive smooth talking to the wife, I went ahead and purchased the Reeflo Orca model 250. My first impression was that the skimmer was built like a tank! The skimmer's quality is awesome. It took about a week to break in and after that, I knew this thing was something special. The head of foam produced by this skimmer is like nothing I have ever seen. Even though this skimmer has one large pump it runs almost silently. I am still doing weekly water changes by choice but could easily go three weeks without water changes, if needed, and the tank’s water quality has never been better. 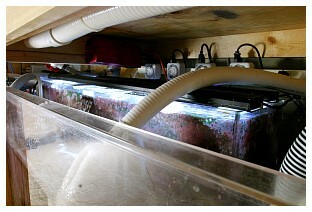 A custom sump was built to my specifications to fit under the tank and to contain a built-in refugium to help eliminate excess nutrients and house beneficial organisms to help feed the main system. I use a 100 micron filter bag on one of the 1½” returns and a second filter bag, filled with Kent Marin Reef Carbon, is placed onto the skimmer’s output drain and replaced every three weeks. All filter bags are changed weekly. They eliminate small particles in the water and help keep the tank clear to improve light penetration. 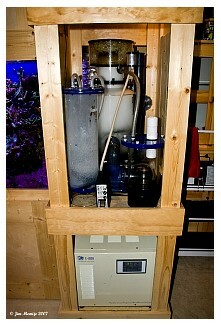 The main filtration system is driven by a Sequence Hammerhead pump. I have plumbed many Cichlid, FOWLR and reef systems over the years, and I have chosen to use Spaflex flexible PVC as these systems' main arteries. This material very effectively dampens vibrations, which, in turn, reduces the overall noise produced by the system. The main reason for the flexible PVC is the versatility it allows and the prevention of multiple 45 and 90 degree bends. In effect, the overall head loss is much less than what I would get with rigid PVC. Flexible PVC can be tucked out of the way of anyone’s sump system to allow for easier maintenance of whatever sits under the aquarium. It is not the only way to plumb an aquarium, but for me, it is the most manageable. 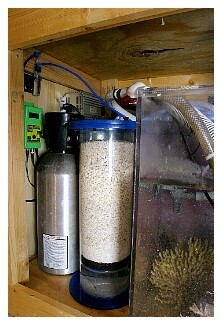 Another form of chemical filtration I use as a supplemental maintenance tool involves a 200mg Red Sea Ozone generator. 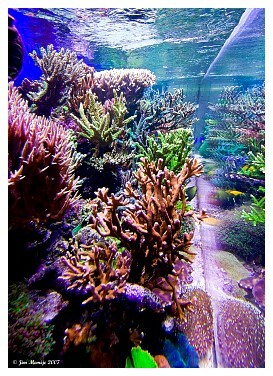 Of course, it also enhances the aquarium's aesthetics, because it is very effective at maintaining water clarity. By using ozone as a maintenance tool, along with Kent Marine Reef Carbon, I can keep crystal clear water that helps to produce more food for my light-loving corals. When dosing ozone, I want to be able to monitor the system as the water becomes progressively clearer, to prevent overdosing. Again, I would like to state that I use ozone only after carefully observing that my aquarium can use a boost. Ozone can be very dangerous to an aquarium if overdosed, which is why I choose to dose it in this manner. 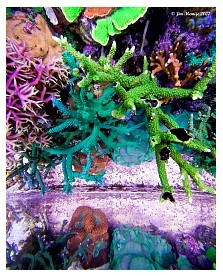 On a side note to my reefkeeping philosophy (see below), I feel that ozone is the icing on the cake for enabling deep penetration of the light source for accelerated coral growth. 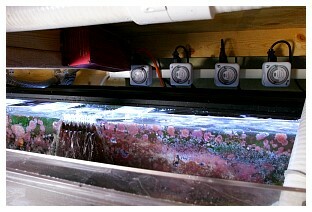 The refugium contains 4” of sand, Cheatomorpha macroalgae and roughly 200 pounds of live rock. The refugium operates on a photoperiod opposite that of the main display in order to reduce heat generation during the day and to help counter the system’s falling nighttime pH. 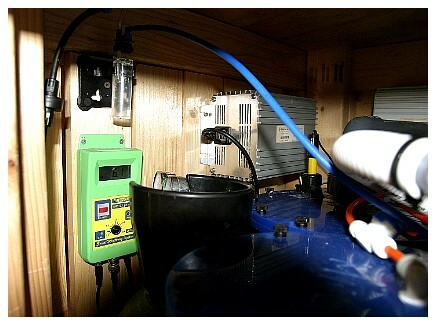 A 50-gallon reservoir of fresh RO/DI water, located underneath the tank, is connected to an auto top-off unit that supplies my kalk reactor and is filled with E.S.V. kalkwasser powder. The kalk reactor is usually left running without kalkwasser in the canister. I typically dose kalkwasser only when I need a boost to the system. The system evaporates about five gallons of water per day. A Kent Marine RO/DI unit produces roughly 50 gallons of RO/DI water per day, which is collected in a 100-gallon industrial container located in our utility room. I use two small Kent Marine phosphate reactors that are linked together in series. One is filled with Seachem Phosguard at half the recommended dose, and the other is filled with Purigen to help maintain water clarity. 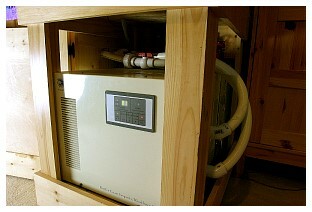 A 220v Pacific coast C-1000 chiller, supplied by a Magdrive 2400 pump, keeps the system’s temperature within an acceptable range. The chiller is set to come on at 80°F with a 2° variance. Simply stated, the chiller turns off at 80°. I had to build a plenum around the back of the chiller in order to vent it out of the house. 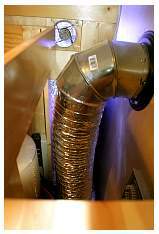 We used 8” flexible duct with an 8” duct fan that is controlled by a temperature sensor. The fan is activated by a heat sensor when the chiller comes on and continues to run for 10 minutes after the chiller has turned off. A custom calcium reactor was built to fit underneath the stand, but still needed the capacity to hold enough media to maintain adequate calcium, alkalinity and magnesium levels. I use a 10 lb. CO2bottle that I fill roughly once each month, controlled by a Milwaukee 122 pH monitor/controller. 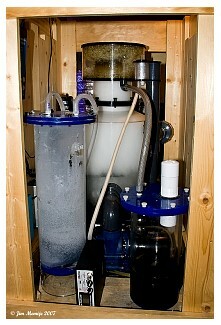 Three types of media are used in the calcium reactor. The first chamber (27” x 10”) holds Gen-X media and dolomite. The second chamber (6” x 27”) holds CaribSea’s ARM media and Zeovit magnesium chips. I try to maintain a pH level of 6.1 – 6.2 within the reactor. Future plans call for a bigger reactor due to the constant battle to keep calcium at my preferred levels. My daily maintenance consists of cleaning the acrylic, checking the monitors/controllers and feeding/observing the inhabitants. Cleaning the skimmer’s collection cup and its remote waste cup is done every three days. I do weekly 100-gallon water changes with Tropic Marin salt, but only to replace trace elements that are stripped by filtration, and not because of poor water quality. Filter bags are cleaned and treated weekly, along with the addition of Kent Marine Strontium and Kent Marine Lugol’s solution. Generally, I fill my freshwater tank weekly unless it's required earlier. 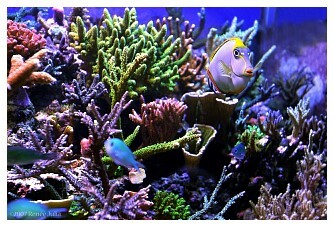 With regard to fish, the reefkeeping hobby is inundated with endless possibilities for species aquariums. As many have experienced, several species of marine fish are not considered “reef safe.” I, too, have become entranced with the beauty of several triggerfish and angelfish species. While some of these species have been kept successfully in reef tanks, I have never had great success with any dwarf angel or angelfish species. Every angelfish I introduced soon began nipping at the corals and was, consequently, removed from the aquarium. I have, however, had some success with Crosshatch, Blue-throat and Sargassum triggerfish, and that led me to stocking the tank with more opportunistic utilitarians in the tang and wrasse families. I know that with the diversity of wrasses and tangs, microorganisms are consumed before overpopulating and algae blooms ever become an issue. I have had issues with Montipora-eating nudibranchs, but shortly after removing the Montiporas and adding the wrasses, the pest nudibranch population decreased to nothing. Many may wonder how it is possible to keep so many tangs in a tank this size. Well, they work for me, too. 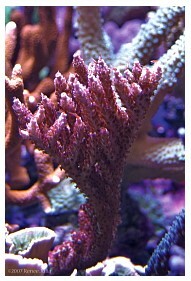 The tangs are wonderful waste producers that feed the Acropora, allowing for intense coral growth. In order to house the five Yellow tangs and four Purple tangs without conflict, I introduced them all at the same size, in the 2-3” range. 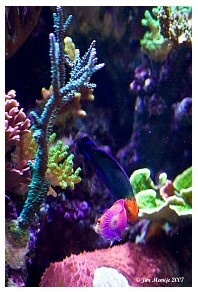 I originally introduced five Purple tangs along with the Yellow tangs. This is a pretty good survival rate, considering the task I was attempting. To take it a step further, it is important to remember that when introducing more aggressive tang species you must consider how they are included in the mix. Typically, I remove an aggressive tang that’s larger than the one I am introducing, and place him into the sump. I know what you are thinking, and trust me, there are no worries because my sump holds 100 gallons or more. The tang stays in the sump for only a week or two and is fed daily to ensure its health. In order to safely introduce the new tang, I feed heavily on one end of this 10' tank and then place the newly arriving tang at the opposite end. I have obviously been pretty successful using this method. I may even turn the lights off for a while as the new tang acclimates itself. You may ask, “How do you get the aggressive tangs out of the tank?” Well, all of my fish are trained to feed right from my hand. I simply grab them and quickly place them into the sump. The use of nets is not a common practice around my tank. When you refer to the fish list below, you may remember that reefkeepers typically quote others who have told them that keeping this many fish in a reef system this size is not possible. 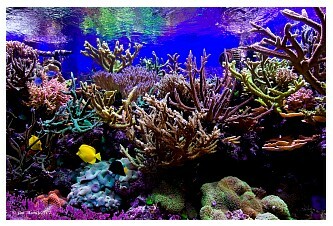 Here, however, is an example of a thriving reef community of reef-safe marine fish. 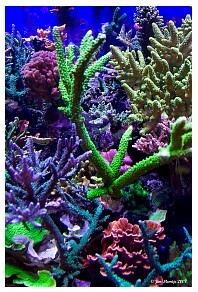 My obsession with corals peaked after diving in Cabo and in Hawaii’s beautiful Coral Sea. 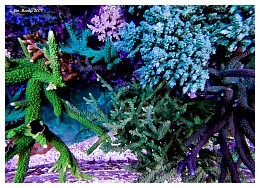 Not long after that, I was growing my own Coral Sea representation. In keeping with my Reef Central username, “Acropora Nut,” I began going a little crazy with the coral diversity in my system. 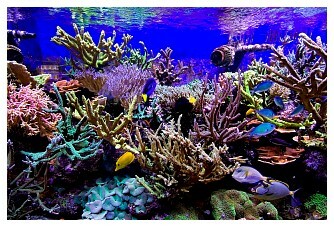 This aquarium houses many different species of various corals. If you haven’t noticed already, I really like staghorns and monti caps. Starting in January 2005, the growth in this aquarium has been outstanding, which is possible because of the growth of many varieties of staghorns and montis when provided with the right conditions. I originally had two large basketball-sized and two volleyball-sized colonies of Montipora capricornis that became infested with Montipora-eating nudibranchs. As mentioned in the previous section, this single event changed my view of keeping many opportunistic scavenger fish such as the many species of wrasses. I started stocking the aquarium with soft corals and LPS species first, in order to gauge the water's quality for housing the more delicate Acropora species. 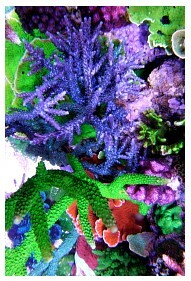 The blue Acropora sp. 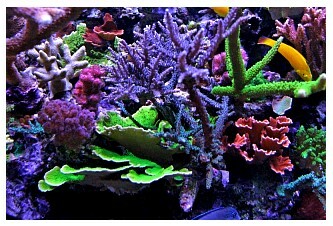 (table coral) in the middle of the aquarium was imported from my 210-gallon reef aquarium at a size of about 6”. It has now grown into two sections with an approximate length of 14” from the farthest ends to 10” at its widest area. 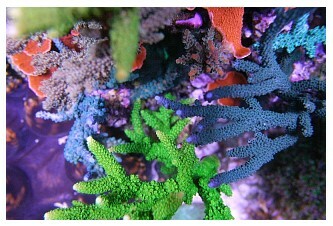 For the first time, on July 27, 2007 I was fortunate enough to witness the spawning of the green Acropora sp. 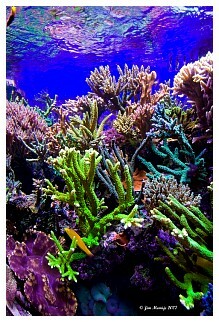 with blue tips (staghorn coral) in the middle of the aquarium for two nights. Coincidentally, the spawning began the night before the full moon. 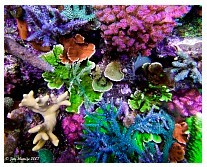 I knew corals and invertebrates were spawning in my tank, but had never witnessed it until those nights. Although they are not the greatest, I shared some pictures, as well as a video, of the spawning on this Reef Central thread. As expected, the Green chromis were pretty plump after those two nights. 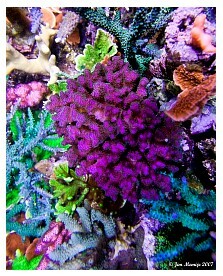 Other corals that I know have spawned include my pink Pocillopora sp., Euphyllia sp. 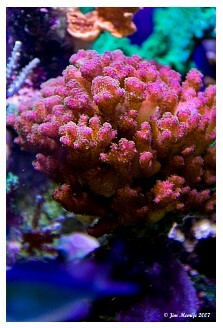 and torch coral. 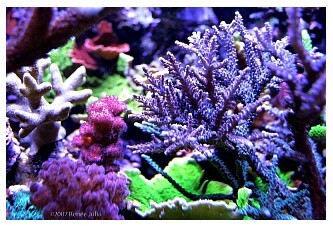 I know this because colonies of these corals are growing in other parts of the aquarium where I did not place them. 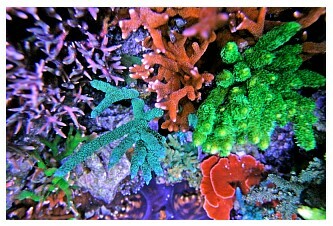 Other corals introduced from my previous reef aquarium include the green torch coral, various mushroom corals, star polyps, green tongue coral, disc corals, button polyps, zoanthid corals, a pagoda cup and various SPS frags. 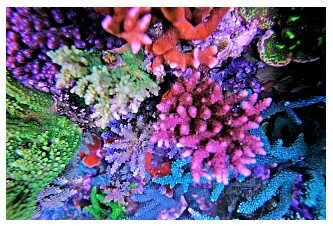 About 75% of the SPS corals you see were introduced as 2-5” colonies and/or as frags. Even though my obsession is primarily focused on Acropora species, I remain unable to relinquish my passion for LPS species and soft corals. These corals have filled in so much that I have been contemplating pulling out the mid-section of the tank's corals and growing more of my favorite Montipora capricornis varieties. Recently, as my Coral Sea representation has run out of space, I’ve begun gluing coral frags and small colonies to the aquarium’s back wall. 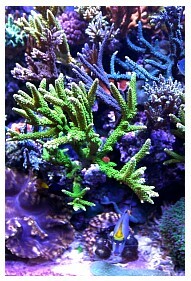 I have recently realized this fate as my green Millepora sp. and Seriatopora sp. have grown out of the tank and need to be fragged. As you would probably expect, I am very generous with my corals and share/trade with fellow reefkeepers on a regular basis. Any Coral Sea biotype would be lacking, in my opinion, without a variety of invertebrate life. 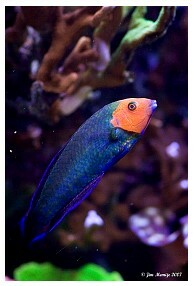 It is difficult to remember everything that I have introduced to the aquarium over the past couple of years. What I do remember, though, is introducing a variety of snails, shrimp and starfish. They are wonderful detrivores and sand stirrers that are more than happy to get all of the food particles that manage their way into the far reaches of the tank. These little guys work for me, too. 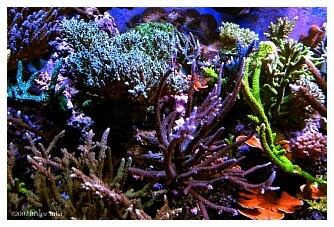 I may be asked if I have ever kept anemones, and yes, I have in other reef systems. 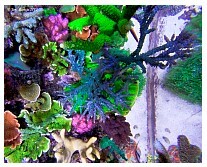 However, in a densely populated Coral Sea representation such as this, keeping anemones would be too much trouble to properly ensure the health of my corals because it would be difficult to prevent most anemones from finding an undesirable final destination, where they could sting the corals. The most notable additions to the aquarium are the seven different Tridacna clams, including squamosa, crocea and maxima species. In addition to the green Acropora that spawned in my aquarium this past July, my large 15” Tridacna squamosa also spawned on the second night, the night of the full moon. I was not worried about the Acropora spawning because I immediately saw the Green chromis enjoying themselves tremendously. However, when the T. squamosa spawned it immediately raised a red flag to do a water change after the chromis and the little inverts had had their midnight snack. In terms of notable growth of any invertebrates I keep, the T. squamosa has grown from 6” to 15” and the T. maxima has grown from 4” to 9.” With over 1000 lbs. of live rock to hide in, some of these little invertebrates rarely show themselves. 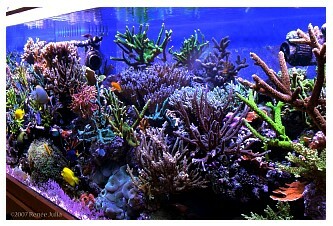 I feed every day in large amounts to keep my fish fat and the corals happy. Daily feeding consists of a combination of brine shrimp, squid, mysid shrimp, Cyclop-Eeze® daily, DT’s oyster eggs and DT’s phytoplankton (3 x per week) for the corals. Mussels, Marine Cuisine, Formula Two by Ocean Nutrition, New Life Spectrum, one sheet of Green Marine Algae by Ocean Nutrition, HBH super soft Spirulina, Krill, Plankton and Reef Plankton are also fed daily. I feed both the main display as well as my refugium. 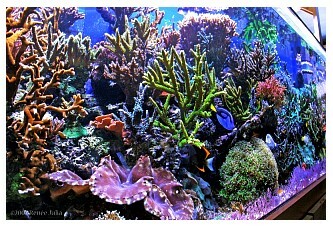 Applying this method ensures the health of my fish, corals, invertebrates and microdetrivores (the real clean-up crew). It is impossible to mimic the variety and amount of food sources that are available on the ocean’s coral reefs, but I do the best I can to offer as much variety as possible, as well as regular feedings. In order for this philosophy to succeed, heavy skimming is required, which, I believe, removes whatever is not eaten by the fish, corals, invertebrates and microorganisms. A question might be raised about the removal of trace elements by this method, because of the heavy skimming. In order to make this a non-issue, I perform regular weekly 100-gallon water changes. Again, I would like to point out that although water changes may reduce nitrate and phosphate, my main goal with regular water changes is to replenish (feed) the trace elements within my tank. I know that if I waited longer between water changes that my nitrate and phosphate levels would stay where they were with weekly water changes. Another element in feeding involves the lighting that I use. 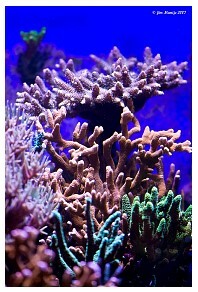 The main source of our corals' growth comes from the light we provide. As stated earlier, I attribute much of my success to the lighting system I use. A crucial element in feeding involves finding the best possible way to balance alkalinity, calcium and magnesium. In order to achieve this, I use a calcium reactor with supplemental kalkwasser. 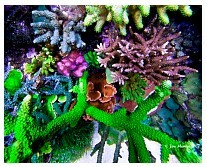 This is the building block to the corals’ skeletons and must be maintained in order for a reef to thrive. The last element in feeding involves the water circulation provided in the system. By using efficient Tunze pumps, I can circulate excess nutrients through the skimmer, provide food to the tank’s inhabitants, and distribute the oxygen needed for the system’s health. All of these factors are related to each other. If one of them had been lacking, my experience shows me that it would have been difficult to keep this reef tank thriving. 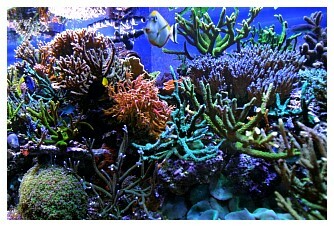 As long as I can provide enough food for the tank’s inhabitants, nutrient removal through heavy skimming, a lighting system that enhances both growth and color, the replenishment of trace minerals through weekly water changes, and proper water circulation for the tank's needs, I know I can be successful with any tank that my obsession leads me to in the future. There are many great captive reef tanks within the hobby today, and I am honored to have my tank posted as Reef Central’s Tank of the Month. I would like to thank my wife Holly, my son Maddux, and my close friends for supporting my relentless fascination with the reefkeeping hobby. 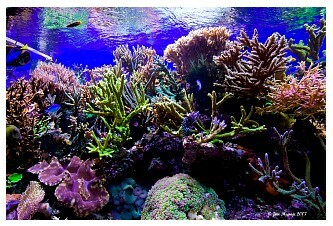 I would also like to thank the Reef Central community for nominating and admiring my tank and its inhabitants. 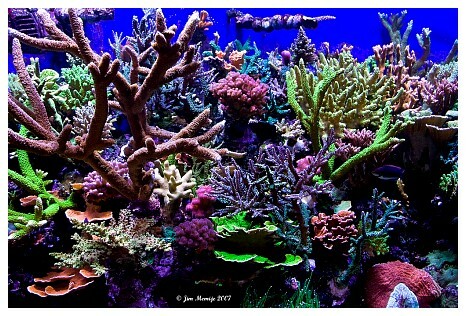 A special thanks to Renee “reneejulia” and Jim Memije “bubbletip2” for their outstanding photos of my tank, its inhabitants and the equipment presented in this article. I would also like to thank my fellow aquarists around the world for providing the advice and inspiration that have made my tank what it is today. I thank you!